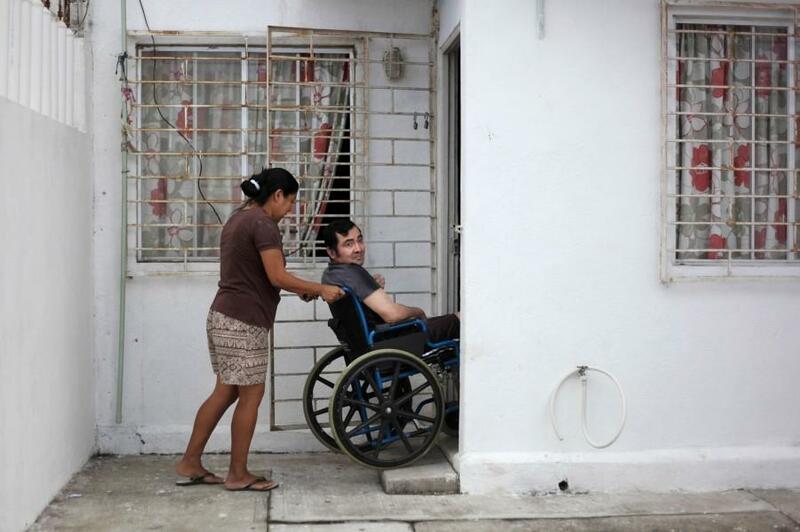 In this photo taken Thursday March 7, Jacinto Rodriguez Cruz, 49, leaves his home in a wheelchair with the help of his wife, Belen Hernandez in the city of Veracruz, Mexico. Cruz and another friend suffered serious injuries during a car accident May 2008 in northwestern Iowa. After his employer’s insurance coverage ran out, Cruz, who was not a legal citizen, was placed on a private airplane and flown to Mexico, still comatose and unable to discuss his care or voice his protest. Hospitals confronted with absorbing the cost of caring for uninsured, seriously injured immigrants are quietly deporting them, often unconscious and unable to protest, back to their home countries.